A variety of driveway marker colors for obstacle differentiation/identification while snow plowing. These are the snow stakes we use in our own snow plowing business for faster & safer plowing. Order in bulk for great rates. 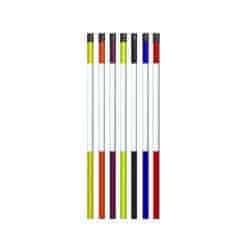 5/16″ in diameter snow stakes which is essential for durability and longevity. Super poly cap to protect the driveway marker during installation. Reflective tape on the driveway marker for ultimate visibility. Arrow tipped at the bottom to easily pierce the ground with the snow stake. Before we list some staking guidelines, let’s be clear on one thing. You can stake any way you want as long as you are CONSISTENTand the stakes help you PREVENT DAMAGE. Stakes are just a communication tool to let you and other people know where things are at such as the edge of a drive. As long as you know what the snow stakes mean, you will do alright. Be aware of local laws regarding markers used at the end of a driveway. For instance, Minnesota lawdictates you put reflectors a full 12 feet in from the edge of a roadway’s shoulder, and Minnesota recommends avoiding red or yellow reflectors. For very sensitive items, use two stakes. Put one stake about two feet before the object and the other about two feet after the object, so the snowplow operator has a little wiggle room as they work to keep the snow away. Put markers in about a foot from the edge of the pavement giving the snow room to pile up without burying or bending the stake. Put stakes as “goal posts” where you want the snow to be piled, so you don’t bury or damage them. Now you can just “shoot for the goal” with all that snow. Professionals should use different colors to signify different things. When a person is on a site for the first time, they will have a color cue as to what the specific hazard is while removing snow. Leave stakes in until the trees have fully pushed out their leaves. Removing stakes too early could mean you get caught without them during a late season snow storm. It is better to use a stake (a fiberglass rod with 360-degree reflective tape) than a marker (a stick with a reflector on it) because a reflector can spin and when the reflector gets sideways, it can become hard to see. Stakes are generally cheaper anyway. Resist the urge of engineering your own stake like a piece of wood with paint on it.If someone has to remove snow for you, they will not recognize it as a safety marker for snow removal. Snow stakes are so inexpensive you are better off just buying the fiberglass rods than creating your own. Make sure your stakes are high enough above the ground to show above the highest likely standing snow accumulation. You never see snow get near your total winter snowfall as it compacts and, in most areas, there will be times of thawing, but you DO need them to show through the entire winter! Take note of where you wished you put a snow stake. Whenever you have a new property, especially a large property, you will always find a place you wished you had staked this year. Make a map of where the stakes should go for next year BEFORE you pull them out. Stake radiuses or curves with at least three stakes. Place the stakes at the beginning, end, and zenith of the curve. You may want more stakes for a large curve. Buy your snow stakes in bulk from Snow & Ice Salt & Chemicals Unlimited LLC! Yes, we couldn’t resist the urge to put in that plug. We have several colors to choose from, and we can even ship them to your door.